Sites We Like < Does your dog have a sense of humor? Does your dog have a sense of humor? Does your dog ever make you laugh – on purpose? Does he know he’s being funny? 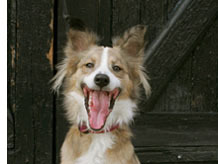 An even stranger question – does your dog find things funny? There are countless stories of dog antics and behavior that are funny, but most of those you’d have to say are unintentional. Humorous behavior may be repeated because of the positive reaction received. In this case, you can’t say the dog has a sense of humor, but is acting on positive reinforcement. But dogs may be a little smarter than that. Just as some people enjoy making others laugh, it would seem, so do some dogs. Author Stanley Coren tells of his Cairn Terrier, Flint (click here to read the rest of the story), who frequently seemed to try to amuse his owners.